Does Anyone Advertise Their Books on the B&N Website? Amazon got a lot of attention in author circles when I broke the news that they were now letting all authors advertise on their site, but they're not the only bookseller where authors can promote their books. An author over on KBoards noticed this morning that Barnes & Noble also sells advertising on its site. 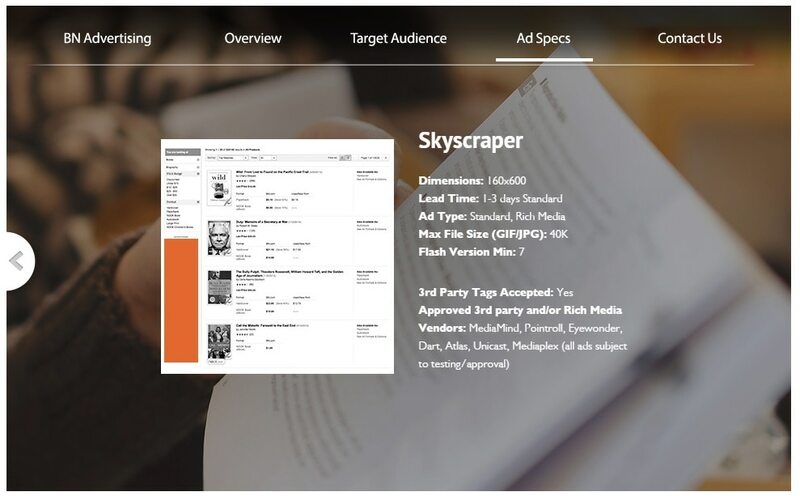 The retailer places standard display ads either above the content on a page or to one side, in a variety of standard sizes. The ads on B&N look like ads and are labeled as such. In comparison, Amazon lets authors blight the search results with ads. The latter might be more effective, but the former is less in the way of visitors. So tell me, have you advertised your books on B&N? I have just heard about it myself and I am still waiting to hear back from the ad team, so I can't tell you how effective the ads are or their cost. But the lack of an interface for uploading ads suggests that this ad network is a manual operation targeted at pockets deeper than mine. That could mean that the minimum ad buy s higher than authors can afford. Would you advertise your books on B&N, if you could? Some indies who aim to hit the USA Today bestseller list buy these. I’ve heard the minimum buy-in is over $3k. That’s _way_ outside my reach, much less what most authors can afford.